Taking selfies can be very dangerous. A couple of years back a boy fell 1,640 feet off a cliff while taking a selfie and survived. Selfies have also helped cause damage to very old statues. Last year, Croatia warned tourists to stop taking stupid selfies! 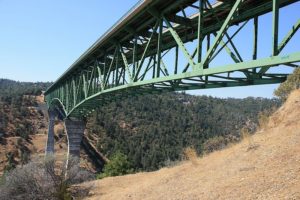 Earlier in the week a woman fell off of Foresthill Bridge (California’s tallest bridge) while taking a selfie. The woman, from Sacramento was with a group of friends at Foresthill Bridge. They were walking on the girders underneath the bridge (which is illegal) when the accident took place. One of woman’s friends said that the group was going to take a photo together just before the accident took place. The woman stepped on a bolt which caused her to lose her balance and fall backwards. Find out more from T+L here.